San Domenico offers a rich three year program in contemporary dance, including modern, jazz, ballet, and creative movement. During the second semester the focus shifts to student choreography, with final performances choreographed by the students themselves. All classes perform in collaboration with the music and art departments in the middle school Christmas show and the spring Arts in Action. Performances are held in our state-of- the-art Hall of the Arts. The class gives students an opportunity to learn co-ed ballroom dance in a safe, fun, and structured environment, before embarking on their upper school experience. Styles include salsa and / or swing dance. The Ensemble is made up of dedicated intermediate and advanced dance students. 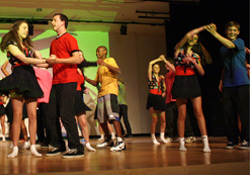 They perform several times a year, in all-school events, the Upper School Dance Concert and the Middle School Arts shows. Our dance faculty members have performed with companies such as Oakland Ballet, The Dance Brigade, American Dance Machine, and the San Francisco Jazz Dance Company.